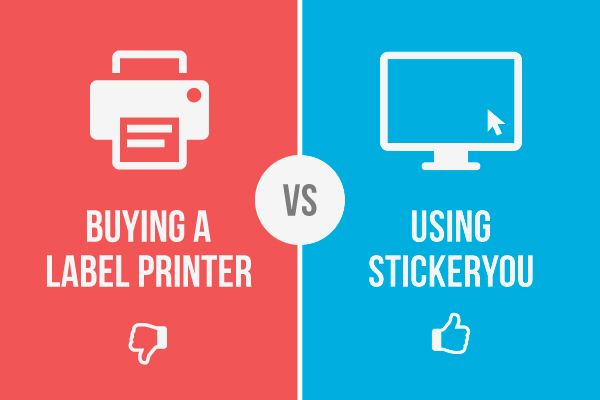 If you're running a small business or operation and are printing product labels and stickers on a regular basis, it makes sense to weigh your printing options. When considering whether to bring your printing processes in-house or outsource them to a reliable supplier, the decision usually comes down to a few key factors. To make things easy for you, we've listed the pros and cons we hear most often from our clients and friends who are considering using a supplier or buying a printer themselves. Note: we know for a lot of small businesses, cost and budget is the most important factor. To help, we've broken down the rough cost per year of outsourcing your label printing, versus printing them in-house. See the numbers at the bottom. Depending on the size of your business, the quantity of labels you need, and the frequency at which you need your labels, it may be more cost-effective to invest the time and money into a label printer you can use in-house. If you are looking for less stress, more space and freed up time for your other business operations, then outsourcing with StickerYou is likely your best option. Our facility operates numerous industrial grade printing presses and we have production teams and design teams in place to ensure your labels are printed to high quality standards. Our fast and easy online ordering process ensures you can get back to running your business. As a professional printing service, you can trust your product labels or business labels are in good hands with us. Test out our printing quality and materials for yourself! Request a free sample pack to try before you buy!